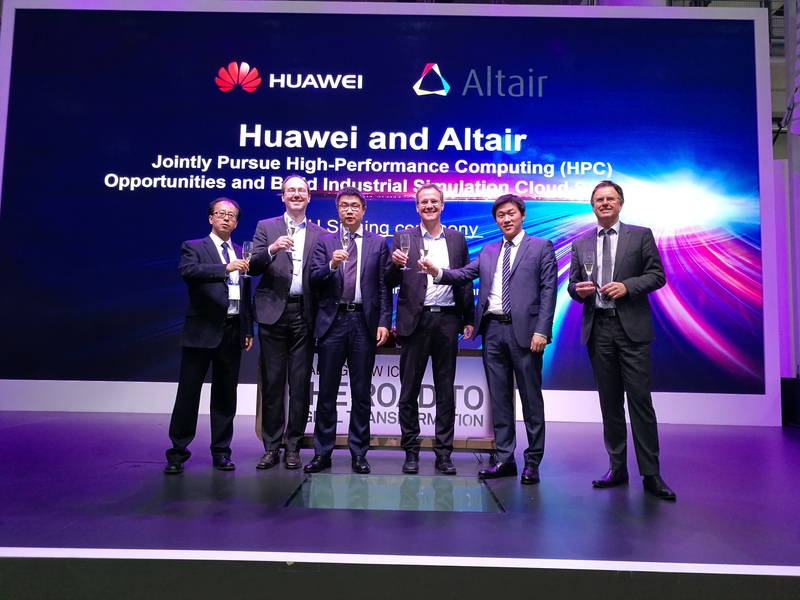 Hannover, Germany, March, 24, 2017 - Huawei and Altair have signed a Memorandum of Understanding (MoU) at CeBIT 2017, marking the beginning of a cooperation for High-performance Computing (HPC) and Cloud Solutions. The two companies will cooperate with each other to develop industrial simulation cloud solutions for their customers. In accordance with the terms of the cooperation, they will build a joint test center in Huawei's Munich OpenLab to carry out software and hardware optimization tests based on Altair's PBS Works and Huawei's HPC and cloud platforms. Taking full advantage of the high performance and reliability of Huawei's HPC and cloud platforms, the joint tests will help customers reduce software integration and performance verification workloads considerably and simplify the deployment and management of industrial simulation cloud platforms. Altair PBS Works is the leading HPC workload management suite that offers comprehensive, reliable HPC resource management solutions and policy-based job scheduling solutions. "Digital transformation is now bringing revolutionary changes to the manufacturing industry, especially in the automobile industry. An industrial simulation cloud platform can accelerate engineering simulation tests and allow local and remote R&D personnel to simultaneously work on product designs with cutting-edge technologies and designs, gaining edges in the market. The Huawei-Altair cooperation will be dedicated to building highly efficient, high-performance industrial simulation cloud solutions leveraging Altair’s PBS Works software suite," said Yu Dong, President of Industry Marketing & Solution Dept of Enterprise BG, Huawei, "Committed to a vision of openness, cooperation, and win-win, Huawei cooperates with global partners to provide customers with innovative solutions for industrial manufacturing and help them achieve business success." "We are very happy about this cooperation with Huawei," said Dr. Detlef Schneider, Senior Vice President EMEA at Altair. "By combining our HPC technologies, namely Altair's market-leading HPC workload management suite PBS Works and Huawei's HPC and cloud platforms, we will provide our industrial manufacturing customers with more value for their HPC and cloud applications. This combined solution will significantly reduce software integration efforts and simplify the deployment and management of industrial simulation cloud platforms." Altair-Huawei MoU signing ceremony. From the left: Rockie Shi, Huawei; Dr. Ralf Rehburg, Altair; Victor Yu, Huawei; Dr. Detlef Schneider, Altair; Linyi Tian, Huawei; Dr. Jochen Krebs, Altair.